Every tribe commits to certain rituals. That’s definitely the case with our Zieggy Tribe. We want to introduce you to one of the activities we do within our Zieggy Tribe that has developed into a ritual. Every Wednesday, the leadership team comes together to discuss key performance indicators, or KPI's, and key metrics across all departments and facilities. The group starts every meeting with a leadership topic and exercise. Jamie Schultz, the Head of Engineering for The Ziegenfelder Company, led this week's leadership ritual. 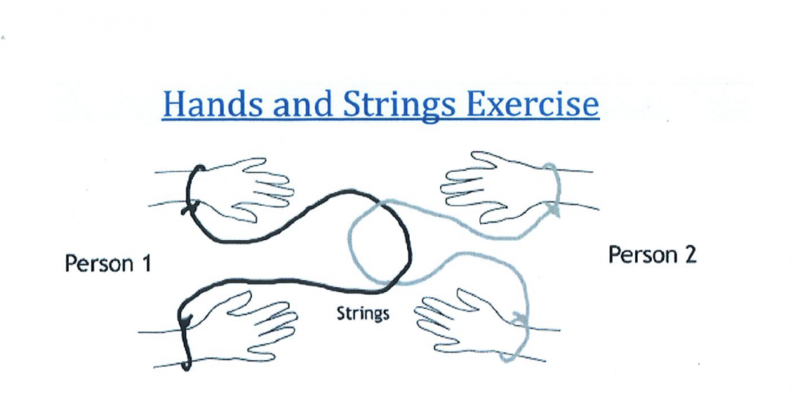 He introduced us to the hand string experience. Below are the directions for the activity. 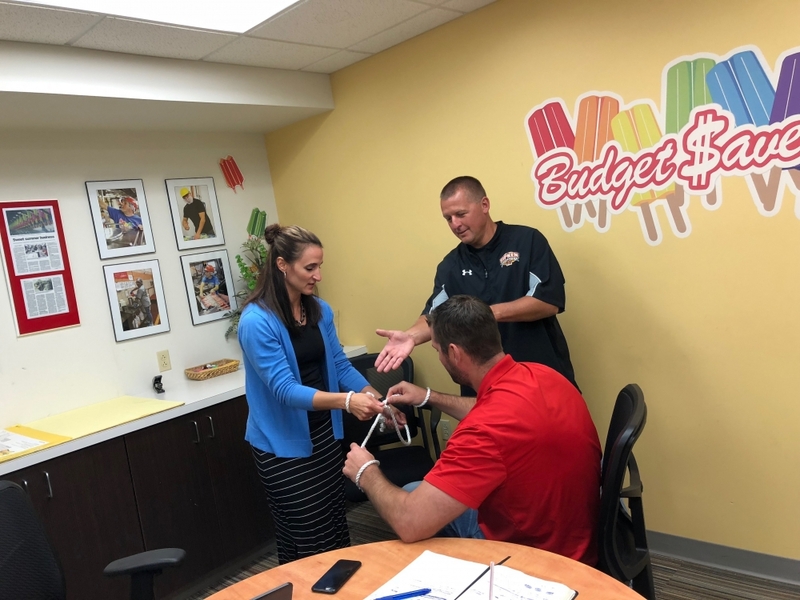 At the end, the groups talked about communication, problem solving, and key leadership traits all important components outlined in our Zieggy Essentials. We hope we might make an impact on those around us by sharing details about these types of rituals within our Zieggy Tribe. Good luck with your own completion of this exercise that we hope will become a ritual. This is a team building exercise where group emmbers need to solve a problem together. Only two people are involved in the actual task and they cannot be replaced. Other team member should provide support or suggest solutions for the two people to follow through. As a result, this exercise provides ample opportunities to see how team approach a given problem, communicate ideas and solve problems. Untangle yourself from the other person while adhering to the rules. Two pieces of strings about half a meter each for each group of four. A copy of the instructions sheet for each group. Divide the delegates to groups of four. Provide two Strings to each group. Ask each group to nominate two people for the exercise while others provide support and suggest solutions to solve the problem. Distribute a copy of the “Instruction Sheet” to each group. Ask the groups to tie the hands of the two volunteers using the instructions provides. Allocate 5 minutes for this initial setup. Once all groups are ready, explain that the objective is to get untangled without tampering with the knots, breaking or cutting the strings. All four members of each group must work together as a team to solve the problem. Observe all groups so you can provide feedbak about their teamwork during debriefing. You can run it as a compeitions between groups in order to add a bit of time pressure to the problem solving task. In this case, place groups wide apart so they cannot see each other easily. After the allocated time, ask those who had successfully completed the task to demonstrate their solution. In case no one could find a solution, you can present the standard solutions. Make sure to do this before moving on so that delegates don’t remain preoccupied with the task. What do you think of your team's approach to solve the problem? Were the volunteers good at listening to ideas suggested by other team members? How was the quality of verbal communication? Could people quickly explain what they meant when they wanted to share an untangling strategy with the volunteer and instruct them to follow on their ideas? Did your group nominate a leader to coordinate activities? Did someone automatically assume the role of a leader? What would you do differently if you were going through this exercise again? What did you learn from other groups’ approaches?